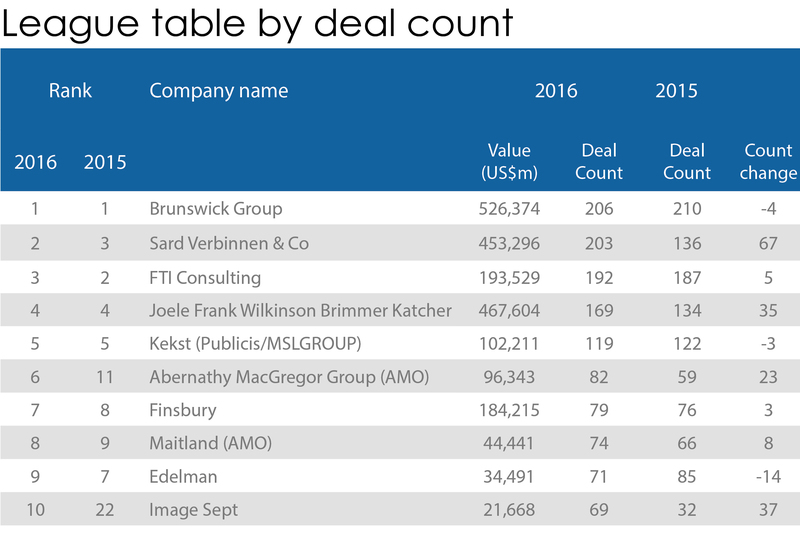 Brunswick maintained its position as the PR agency that offered comms support to the greatest number of M&A deals globally in 2016, although rivals have been gaining ground, new research suggests. Media analysis and data company Mergermarket reports that Brunswick was the leading agency by both value and volume of deals it handled, although in both cases it saw a decline compared to the previous year. Brunswick handled M&A deals worth $526.37bn (£420.3bn) in 2016, down 29.9 per cent against 2015. Behind Brunswick was US agency Joele Frank Wilkinson Brimmer Katcher ($467.6bn), down 7.4 per cent. Finsbury also saw a steep decline, with the value of deals it handled falling 54 per cent to $184.22bn. However, Finsbury’s sister agency Hering Schuppener, which last year formed an alliance with the London-based WPP stablemate, grew sharply – the value of deals it handled grew 157.2 per cent last year to $119.12bn. Publicis-owned CNC saw a surge in the value of deals it handled, moving from $18.26bn in 2015 to $153.43bn last year. The agency leapt from 24th to sixth in the table. FTI Consulting was another strong performer. The value of deals it oversaw rose 37.6 per cent to $193.53bn. Brunswick handled the greatest number of deals last year – 210 – although this was four fewer than in 2015. Sard Verbinne & Co and Joele Frank Wilkinson Brimmer Katcher saw notable growth in the number of deals they handled, up 67 and 35 respectively. In the US, Joele Frank Wilkinson Brimmer Katcher maintained the top spot by value of deals handled ($447.1bn), although that figure was down 11.4 per cent on 2015. The agency also lost the top spot in terms of deals by number (32) to Sard Verbinnen & Co (56) – that consultancy moved from fourth to second in the table by value, handling deals worth $397.64bn. Other notable climbers in the US included CNC, which handled deals worth $111.68bn and moved from 22nd to fifth in the US table; and FTI, which saw the value of deals it oversaw rise 281.3 per cent to $156.76bn. 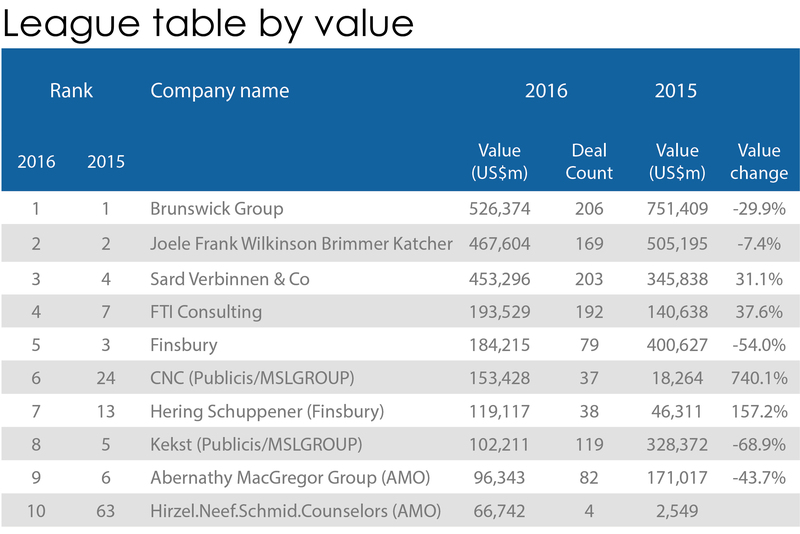 Brunswick, number one in the global list by value and volume of deals, slid from second to third in the US table by value. It handled deals worth $335.2bn in 2016, a decline of 18.1 per cent. Steven Lipin, US senior partner at Brunswick, told PRWeek: "Our clients took advantage of a continued favorable climate for M&A in 2016 and in particular a focus on cross border deals. Now they're focused on the implications of a Trump administration on the deal environment both positively and negatively." In the UK, Brunswick and Finsbury maintained first and second places respectively by value of deals. However, both saw that value plummet by almost two thirds, to $101.4bn and $86.37bn respectively. Other established agencies saw sharp declines. The value of deals handled by FTI in the UK fell 44.9 per cent to $44.56bn, and Tulchan saw a decline of 86 per cent to $9.55bn. Again, CNC saw huge growth in the value of deals it handled, up from $1.6bn in 2015 to $34.71bn last year. In Europe as a whole, Brunswick maintained the top spot by value ($279.29bn), despite seeing the value of deals falling 22.4 per cent. Second in the table by value was Sard Verbinnen & Co after growing the value of deals by 162.4 per cent to $208.62bn. 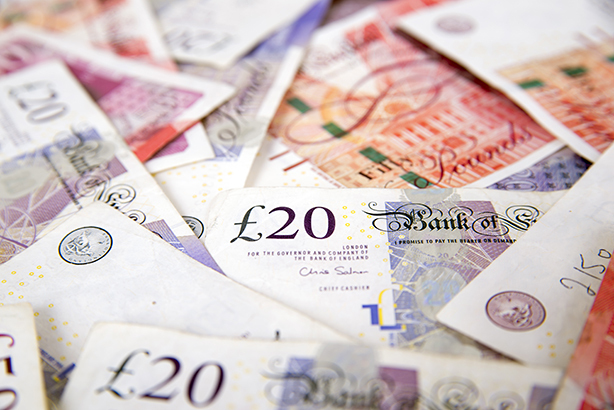 Finsbury fell from second to third in the table by value after seeing its total fall 38.7 per cent to £171.71bn, although sister shop Hering Schuppener grew the value of deals by 157.2 per cent to $118.32bn. Behind Finsbury, CNC moved from 21st to fifth in the table by value after handling deals worth $153.43bn. In Asia-Pacific, Brunswick maintained the top spot by both value and volume; growing the former by 170.7 per cent to $117.21bn, and the latter by 10 per cent to 42. Sard Verbinnen & Co was second by value ($73.69bn), followed by Dynamics Group ($45.86bn) and Joele Frank Wilkinson Brimmer Katcher ($40.02bn). The study looked at M&A transactions over $5m based on Mergermarket’s database. This article was updated on Tuesday afternoon with a comment from Brunswick in relation to its US business.